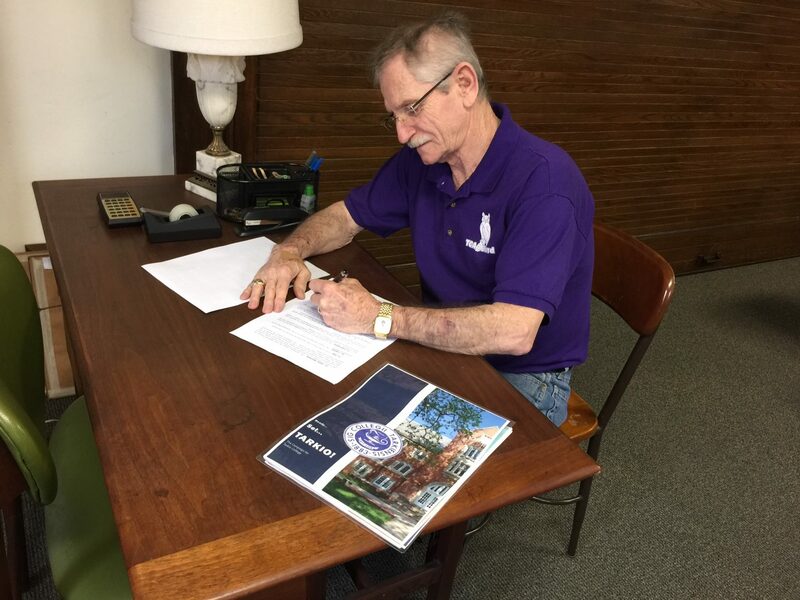 Below: Campus papers being signed by TCAA president Wayne Gelston, and we now own the campus! Come to Homecoming 2018!! Memory Garden installed along with additional landscaping done. 9. A small stove has been added to the "Cook Shack" along with pans hangers and new pots and pans. Work shelf has been added. A large outside grill has been added for our cooking needs. 1. A water line has been run from Rankin to Thompson. 2. Class-room furniture and computers purchased and installed on first floor. 1. Finish second Thompson with classrooms and labs. Some additional work on first floor, as necessary. 2. Thompson roof need to be repaired after air conditioner chiller tower is removed. 3. More cost effective HVAC zoned system needs to be installed. 4. Elevator must be repaired or replaced. 5. Replace lower and second floor lighting with LED’s. 6. All restrooms brought to ADA code. 7. Floors repaired as needed, scrubbed and recoated. 8. Paint second floor walls, repair as needed. 9. Fire alarm system replace to code. 10. Water fountains installed to code. 11. Lower floor Little Theater repaired and painted; repair and replace lighting as required. 12. Replace Ceiling tiles as needed on all levels. We welcome all who can come and work when we call a work week(end). If you can’t come a particular time, please consider an extra donation to carry us along. We especially thank those who have come long distances, stayed in motels and been faithful workers on Work Weekends. We thank the locals who give of their time on a daily basis. And we thank those of you who have sent donations and dues to keep us going.